Is it Safe to Use Lawn Fertilizer Around My Dogs? Dogs should not be on a recently-fertilized lawn. The answer to this question depends on the type of lawn fertilizer. The same elements that make grass grow green and lush often cause canine health problems. To have both a beautiful lawn and a healthy pup to play with there, take a few precautions. The dilemma with the application of lawn fertilizer is that it goes exactly where your dog wants to put his nose. Dogs by nature are scavengers. They like to smell the ground and poke their nose into holes. Trouble is, that is where the fertilizer goes until it is absorbed into the ground for the roots of your lawn to convert to food for the grass. 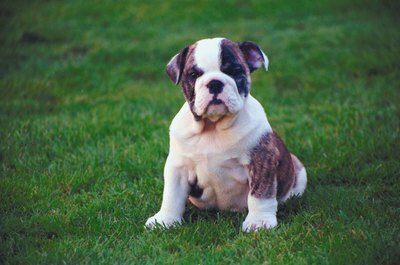 According to Veterinary Medicine's DVM 360 online magazine, many commercial fertilizers not specifically manufactured with the health needs of pets in mind contain mixtures of nitrogen, phosphorus and potassium in concentrations potent enough to cause gastrointestinal irritation in a canine. While it's unlikely an ingestion of these elements will cause death, they were never intended to be in your dog's digestive system. They will most likely cause him a moderate to severe stomachache and bring on vomiting and diarrhea. DVM 360 states that a dog ingesting larger amounts of phosphorus and potassium commonly reacts by being lethargic. Since pet owners want both worlds -- a lush lawn and a protected dog, several manufacturers of lawn care products now produce fertilizers that are considered organic or "more safe" for lawns frequented by animal companions. Even when marketed as "safe," some of these lawn applications may still contain elements that could be harmful to a canine. Thoroughly check the labels to determine the safety of a product. It can take a bit of searching to find a truly pet-safe lawn fertilizer, according to Gardening Central. Some fertilizers are clearly marked as "not safe" while others have no declaration either way. In the case of your canine companion at your home, this should be more than just a posted sign. It should be your mantra whenever you apply products to the lawn. This doesn't have to be a lengthy ban. The Dog Owner's Guide suggests keeping pets off treated grass for 24 hours, as nitrogen can burn the pads of a dog's foot. The guide also recommends keeping pets indoors during application to prevent an airborne inhalation or skin contact. All About Lawns: Does Lawn Care Affect a Dog's Health? "The Truth About Cats, Dogs and Lawn Chemicals"